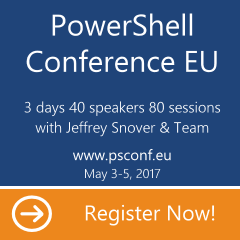 Yesterday Don Jones started short PowerShell challenge on his blog. More details here. 1. Change login details for service on servers from single OU. 2. Table report about disks on file servers from list kept in FileServers.txt. 3. Inventory of workstations – exportable and easy to filter. Yes, that is technically one line… 😉 And you get $PCList object with methods .ToCsv([string]$Path); .ToHTML(‘[string]$Path); .ByOSVersion([string]$pattern) and .BySP([string]$pattern. Imagine you have it in your profile and now when you need info about PCs you just to $PClist.BySP(2) and get all PCs with Service Pack 2. 😉 Of course in production it requires some extra work, because it would get only online machines. 4. Create users from Users.csv and add them to Employees AD group.